We’ve all heard the saying ‘you are what you eat.’ The logic behind this phrase is that your body is made up of what you put into it. Healthy foods and water will help you with healthy organs and systems. Unhealthy foods and sugary drinks, on the other hand, lend themselves to weight gain, susceptibility to viruses, and a breakdown of how your body functions. As a dentist Merced residents trust for their cosmetic dentistry and oral hygiene needs, we, too, focus on what you put into your mouth. However, while proper nutrition is essential for good oral hygiene, germ-free toothbrushes are also important. It also helps to wash hand towels and bath towels more often in order to avoid spreading any illnesses throughout your home. As far as your oral hygiene needs go when you are sick, it is a must to replace your toothbrush. The handles and bristles can pick up germs keeping them around much longer than you want. 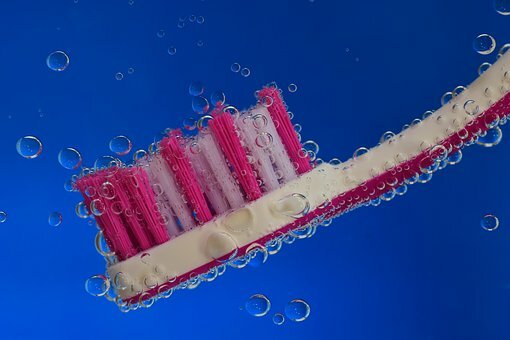 Our Merced dentist and the ADA recommend replacing toothbrushes every 3 to 4 months. Rather than sanitizing your brush, simply swap it out for a new one. Store your toothbrush upright, off of bathroom surfaces. Additionally, don’t let your toothbrush touch another brush. If you are not sick, but the owner of the other toothbrush is, then it is only a matter of time before those germs transfer to you. One last piece of advice from our Merced dentist and staff is to continue practicing great oral hygiene. Brushing and flossing keep decay and bacteria from your mouth. This, in turn, keeps bad things from entering your body and bloodstream which can diminish your immune system. Drink plenty of water and choose foods that are good for your health and body. A great regimen focusing on your oral hygiene needs, and extra cleaning and hand washing will help you avoid the flu season this year. Nutritious foods and lots of water will boost your immune system and help you fight off any germs that you come into contact with. Remember to replace your toothbrush every few months and you’ll be in good hands. Follow our Facebook page for more health and oral health tips or give us a call with any questions. Your oral health is our priority and we are happy to help you and your smile stay healthy.